Years of planning, re-planning, decisions, sweat and more decisions has led to the construction of this smart city. Every inch of the design has been obsessed over and we think it shows in final product. Six years later, the blue prints are etched in stone and the build is well under way, so we sat down with two members of the Bhartiya team responsible for overseeing the design to get an insight into Bhartiya City through their eyes. How does Bhartiya City, from an architect’s point of view, stand out from other smart cities in India? Bhartiya comes from a background of design. There is a clear attempt to go beyond the existing township schemes in India, by focusing on the design of the public realm, along with creating open space networks and implementing sustainable practices that revolve around the use and re-use of water and solar energy sources. Bhartiya City will allow users to play a role in nurturing these intricate layers, which other townships have not taken into account. Bhartiya City focuses on retaining and enhancing quality of life which is often neglected or taken for granted in most major metropolitans in India. Is this a smart city built on form or function? Smart cities have only just begun to emerge in India and a lot of them talk about integrated services and technology- but really that’s basic for a bangalore smart city. We are going beyond the boundaries. We are not only integrating the infrastructure, technology and services but we are integrating function. Not every smart city in India is integrating everything, but in Bhartiya City, even public spaces are interconnected. We are creating a wholesome lifestyle by networking user groups and functions at many levels; we promote easy access and usability between the people and the city. Is there one style of architecture that flows throughout the city? We have architects from all over the world working on this project. Of course they all have their own style, but Bhartiya City is seamless in design, meaning our team works collaboratively to keep a close eye on what everyone else is doing. Everything is coherent and timeless with universal design, so no one building is designed to stand out from the rest or is ever able to become isolated in the city. We design places within a city. Tell us more about where the team took their design inspiration from? We mostly took our inspiration from European cities such as Amsterdam, Rotterdam and Copenhagen, as there is nothing apt in India for us to take inspiration from right now. Our master planning drew inspiration from their brilliant transportation networks and the fact that the use of public transport is encouraged and promoted. We like the distinct architecture of flowering trees along the avenues which bring character, as well as the the fact that people can walk or cycle to work without any hindrance from vehicular traffic, which is missing from India right now. You can see the difference in the living conditions and the natural environment. We might create the first Indian smart city that future township developments in India will take inspiration from; this is our aim right now. What do you believe makes a happy community? People are happy if the spaces they use on a daily basis are designed thoughtfully, taking into account their current lifestyle pattern. Public places that allow various functions are the best kind, as they promote equality and diversity. These need to be highlighted. 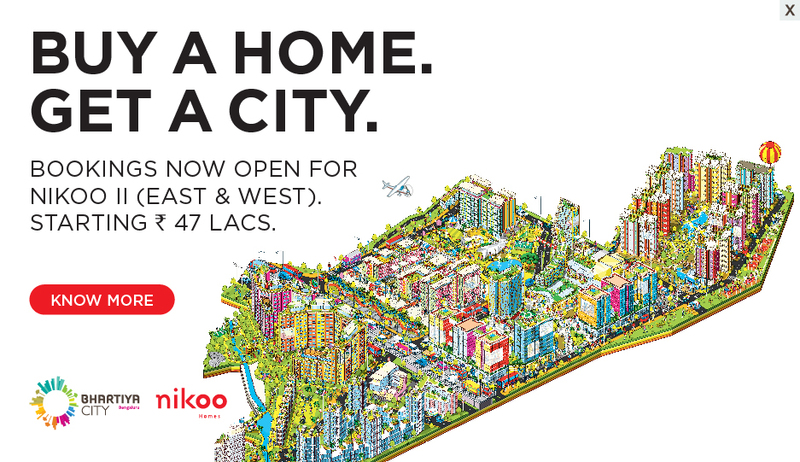 Every floor at Bhartiya City Nikoo Homes II has an extended area with kitchen gardens to share. We are full of ideas, for example, we plan to teach kids about vegetation and agriculture. We hope they will then teach the home owners how to use the vegetable gardens- it’s all very interactive. During the weekends, the school will be used as a market place for the city where people can buy the students’ home grown produce. Why is it so important to have so many green spaces throughout the city? Aside from serving as the lungs for settlements, green spaces need to go hand in hand with the corresponding built environment. Trees provide much needed shade and protection from the elements. Cities have neglected the importance of trees, gardens and parks, which serve as gathering points/ pause points for people to interact and bond. Is this a sustainable city? We give a brief to our architects to produce design that includes sustainable development. Our architects suggest local details and we then coordinate with local architects to conceptualise ideas. We use local technology that is available in India rather than importing materials, with the exception of what we import from Italy as we have fashion design studios there and the level of quality is not yet able to be achieved in India. All our services are sustainable through the use of heat farms and thermal energy storage tanks. We also have a solar station in front of the Discovery Centre. Each building will have solar panels on the terrace for the communal area’s lighting. Right now we are putting 10% back into the city, but when the city is 100% occupied and up and running we look to increase this number enormously. What’s your favourite part of Bhartiya City? The streetscape for the entire city. More specifically, the linear park and the garden spaces along the length of the roads create meeting spaces for people coming from the offices. The Performing Arts Centre is very unique too. Although, the one thing that has blown literally everybody who walks into Bhartiya away and not just us, is our landscape and the amenities that we are planning to provide. Everyone who walks in notices a difference between other developers and us with the small detailing that we focus on. It’s in the small things like community spaces, cycle tracks and bicycle stands, which are all things that aren’t available everywhere. These are our personal favourites.